Blazer: Primark. Top: Peacocks. Skirt: River Island. Tights: Topshop. Hello smart and girly outfit. Weird that i'm finding the word girly more appropriate for this outfit then the world feminine, i think it could be something to do with the plait and the cute ruffles on the skirt. Anyways, i bought this skirt off Ebay ages ago for like £1, it's quite short so it has to be worn right on the hips unless your willing to bare all haha! Pretty annoying having to wear it on the hips considering mine are so wide though. I really like the off white/creamy colour of this skirt. It is very childish and girly, something i'd pull out the dress up box when i was younger and pretend to be a princess in haha. 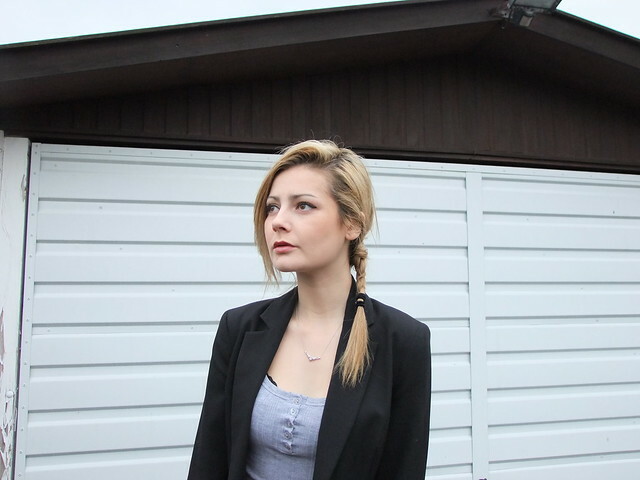 I've worn a very basic top which and fitted black blazer to add more of a classy look. Dress down this look by wearing a pair of converse of vans, and dress up this look by wearing a heeled pair of shoes. My choice would be wedges. The title of this post is from the song on Kelly Clarkson's Breakaway album. This album literally is the reason i survived secondary school, but this song stands out. I know the song 'Because of you' is about love and him leaving her and what not. But if you listen to it and 'read between the lines' you'll know what i'm getting at. 'Because of you i'm ashamed of my life, because it's empty, because of you i am afraid' Those words defined my Secondary school life. This is proper depressing, sorry but i thought i may as well explain the title as it is very meaningful to me. *Title: Kelly Clarkson - Because of you.